Ticket purchases are final and non-transferable. To purchase one ticket, click on “Register”. To purchase additional tickets, add the additional number you wish in the “Add Guests” line on the next page and indicate their name. Table assignments will be made prior to the event. If you would like to sit at a specific table or with another ticket holder, please indicate the name in the box provided. Seating adjacencies will be attempted, but are not assured. OR SOLD OUT. IN THE EVENT WE RECEIVE A CANCELLATION, PLEASE ADD YOUR COMPLETE INFORMATION TO THE WAITLIST AND WE WILL CALL YOU IF SPACE BECOMES AVAILABLE. OTHER QUESTIONS? CONTACT US AT 805-541-0594. THANK YOU AND WE LOOK FORWARD TO SEEING YOU AT THE TEA! The Monday Club International High Tea will bring to life the grand days of travel. Come join us on our exotic international travels as we make our way among steamer trunks, vintage luggage, hat boxes and train cases to the many stops along our route. Elegant tea service from many lands will tempt our senses with wonderful sights, fragrances and flavors. Where will our travels take us? Our destinations may include India, China, Ireland, Switzerland, Japan...who knows where we may find adventure and, of course, tea! Come and explore the high tea of many countries on Sunday, February 25 from 1-3 pm. Friends and family are all welcome. Tickets are $35 and $20 for children under 12. 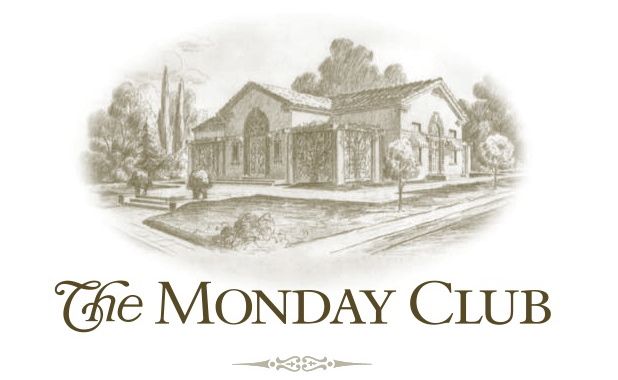 All proceeds benefit the restoration and preservation of the historic Julia Morgan designed Monday Clubhouse.